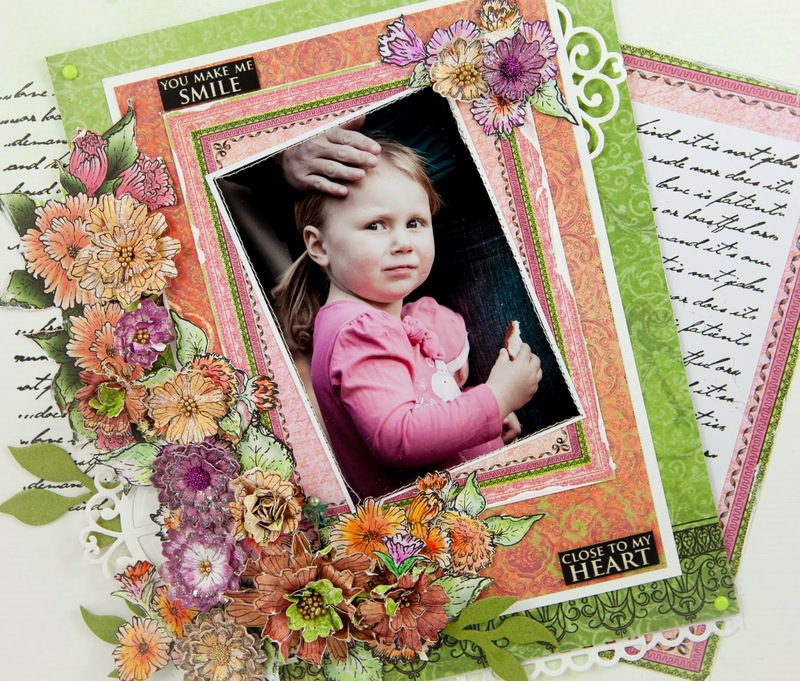 Welcome to another 'Heartfelt Creations Design Team Release Wednesday'. This week it is time for some off the page 'Majestic Morning Collection'. 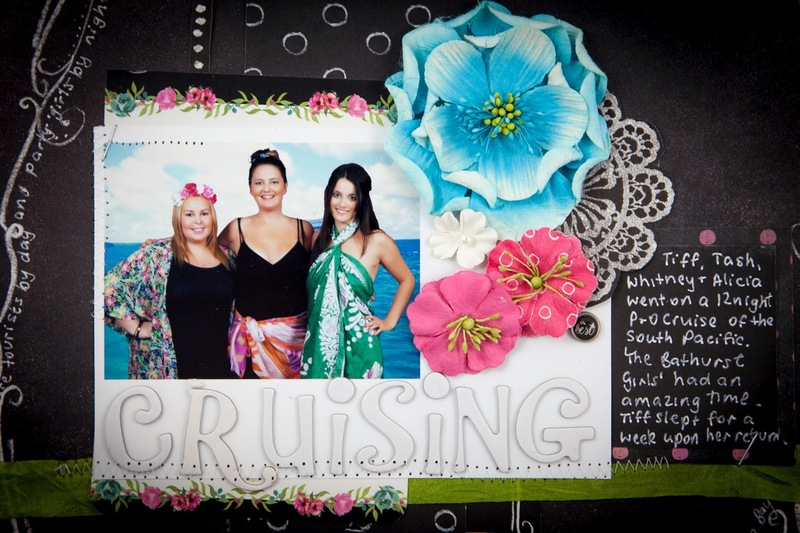 Little calendars with your own photos and craft decorations make wonderful gifts - so personal, practical and pretty. Who can resist those 3Ps. 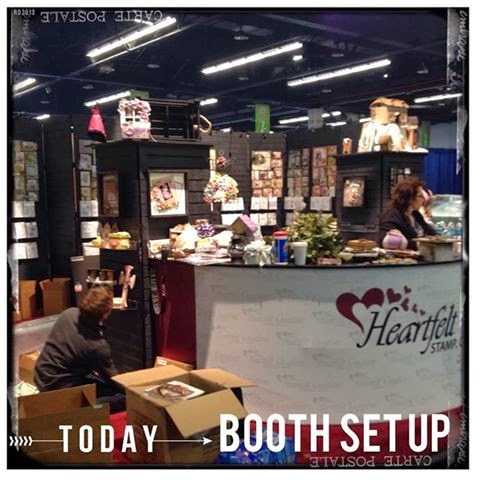 Don't forget to visit Heartfelt Creations for lots of inspiration and fun. Other Products used for project other than Heartfelt Creations. 2. Stamp HCPC 3578 Majestic Morning Background Precut Set and HCPC 3577 Vintage Morning Background Precut Set onto pink paper. 3. 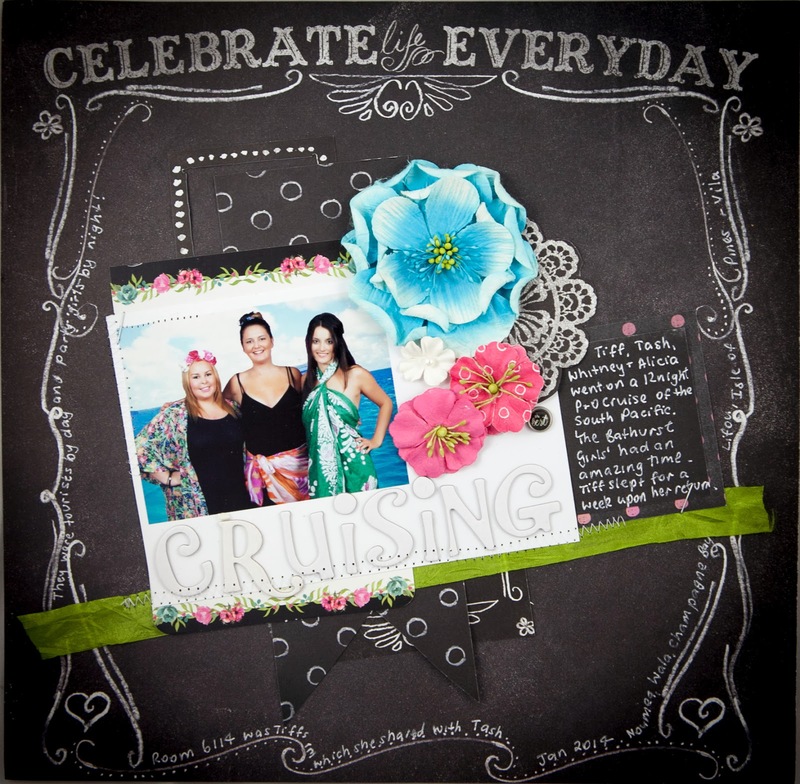 Cut out using the coordinating die HCD 742 Majestic Blooms Die. 4. Make two flowers using the Paper Blossoms Molding Mat and Tool Kit. 5. Add glitter to the flowers and add frinkles to the center of the smaller flower. 6. Stamp the leaves and cut out with HCD 736 Classic Leaf Die. 7. Using the photo as a guide fussy cut the flowers and cut out: frames and tags 2.5” x 5”. 8. Use HCD 718 Decorative Chateau Gate Die to cut white bazzill to create white accents. 9. Print and assemble calendar. 10. Mount onto 6” x 10.5” black bazzill and attach calendar. 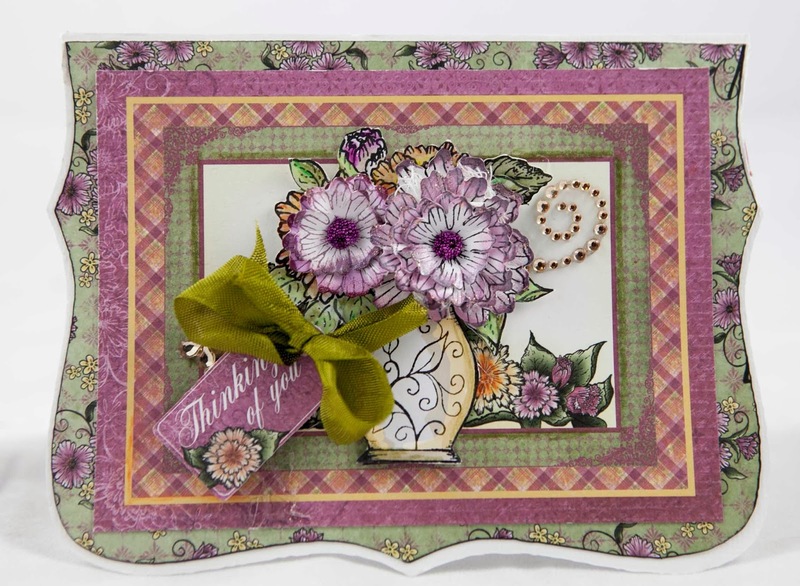 For a bonus this week here is a shaped Heartfelt Creations card featuring the HCPC 3582 Majestic Morning Bouquet Precut Set. White bazzill, Onyx Black Versafine and Brilliance Pearlescent Crimson, ribbon, bling by Prima, frinkles, thin black marking pen and water color pencils or colouring method of your choice. 1. Project measures 6” x 45”. 2. Stamp HCPC 3578 Majestic Morning Background Precut Set onto white paper with Pearlescent Crimson ink. 4. Use Brilliance Pearlescent Crimson to colour the edges of the white paper flowers and apply glitter to all flowers using 159723 Art Institute Glue – Dries Clear with 352854 Metal Glue Tip. 5. Shape the flowers with Paper Blossoms Molding Mat and Tool Kit. 6. Assemble flowers and add frinkles to the center of flowers. Stamp the leaves with HCPC 3545 Open Leaf Precut Set and cut out with HCD 736 Classic Leaf Die. 7. 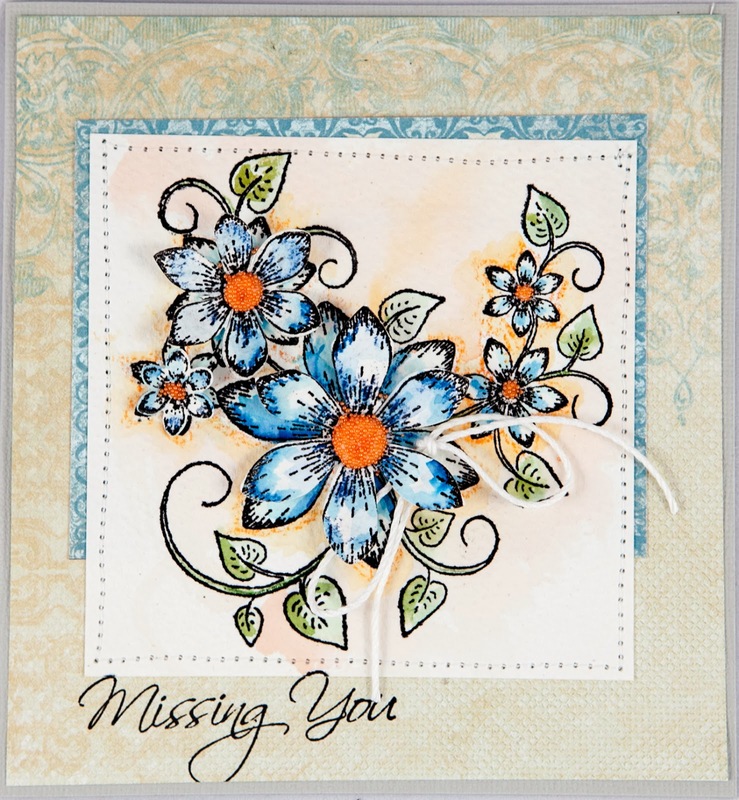 Stamp HCPC 3582 Majestic Morning Bouquet Precut Set onto white cardstock with black ink. 8. Colour the image using colouring technique of your choice. 9. Cut out shaped white bazzill and vertically fold into a card. 10. Assemble as shown in the photo adding the tag, bling and ribbon. Stayed tuned as next Wednesday is the reveal of the stunning February Release called 'Raindrops on Roses'. 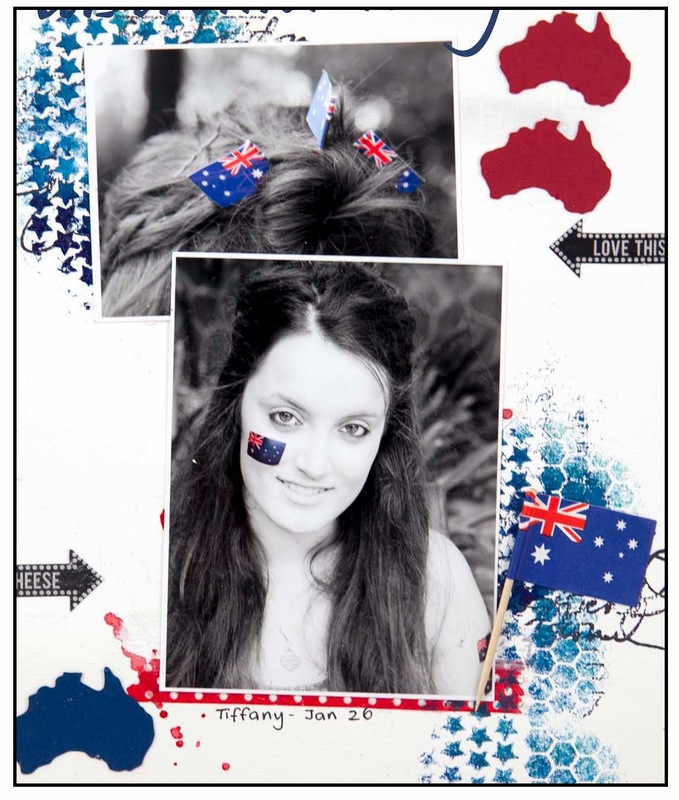 Here is a sneak peek of an Australia Day LO I created. The photos were 'selectively recoloured' which is a digital technique where you convert photos to black and white and selectively 'paint' the colours back in. To see the rest of the LO and the Step by Step instructions for selective recolouring, pop across to the Scrapbook Creations Blog. While you are there have a browse as so many talented people have posted such amazing work and articles. It is now January 2014 and we are all full of New Year's Resolutions. This year I want to give myself a shake up and try different styles. My goal is to choose different artists whose work I admire and try to incorporate features of their style into my work. 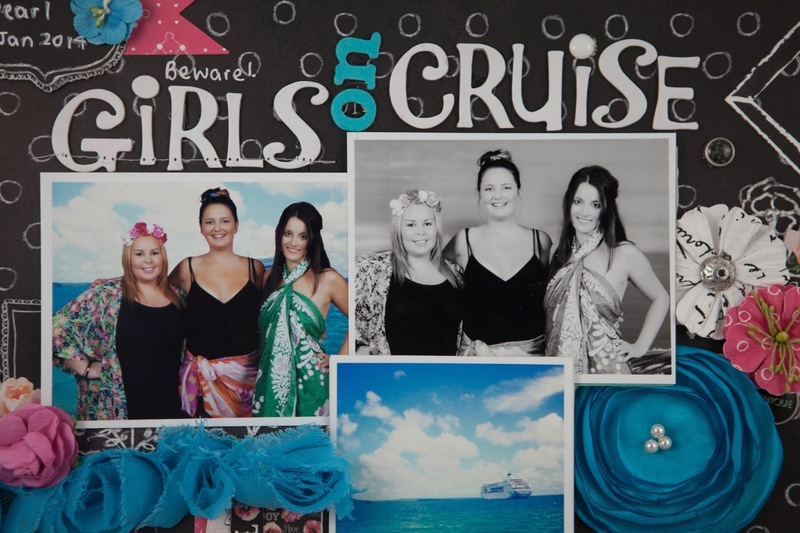 Renee Iveson is my inspirational artist for these two layouts. Her spontaneous and playful style really appeals to me, especially as I feel that my work can sometimes be too prescribed and overthought.. The Prima Optimist Range is bright, fun and playful....perfect for my Renee-esque LOs. 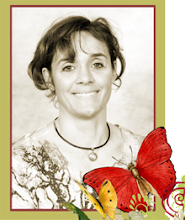 Call by Renee's blog so you too can be inspired. Thank you so much for calling by. I always love Wednesdays as this is when Heartfelt Creations release the new work from their DT. 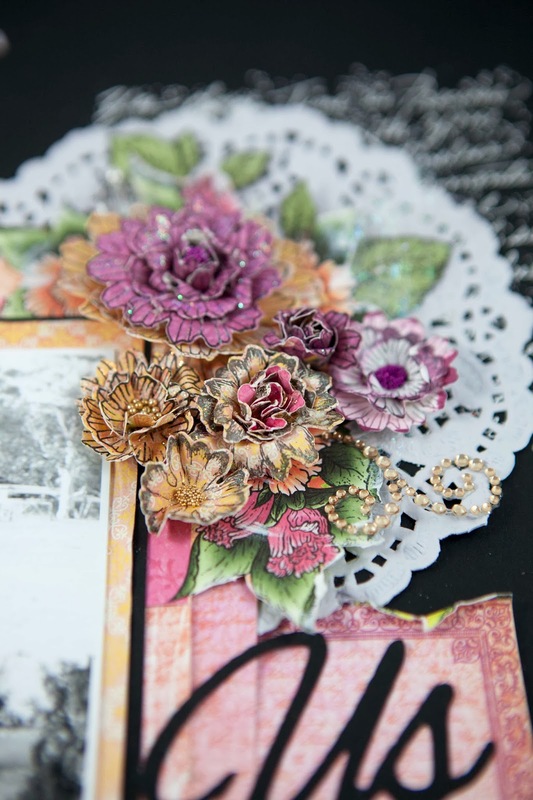 I am having so much fun using HC stamps and dies to make wonderful handmade flowers. 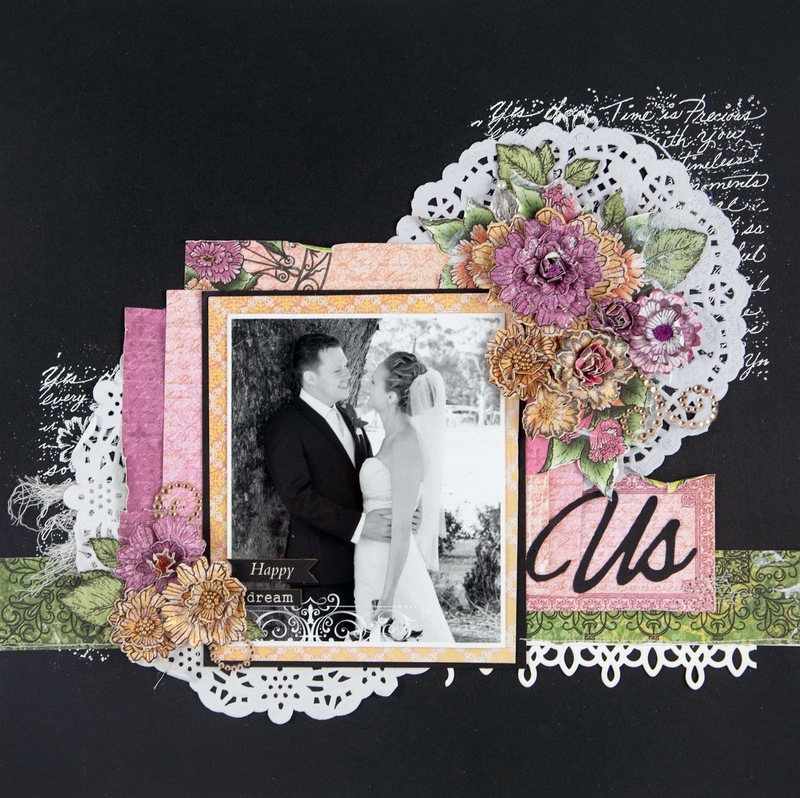 Some of our friends married recently and I wanted to create a LO using the stunning pinks and oranges from the 'Majestic Morning Collection' offset by a stylish black background. The warm cheerful colours really reflected the joyousness of the day. I stamped the collage stamp onto the background black bazzill and white heat embossed it with an opaque white. I was very impressed how the stamp created such an effective background. Have a look for yourself. Black and white bazzill, Chipboard by Scrapmatts, Inks: Versafine Onyx Black, Versamark clear and Brilliance Pearlescent Crimson, detailed opaque white embossing powder, heat gun, sewing machine and thread, pink and gold frinkles, white paint, muslin, doilies and bling by Prima and hat pin. 3. Using the photo as a guide fussy cut the flowers and cut out: orange mat 4.5 x 5.5”, black bazzill matt 4.75” x 5.5”,light pink paper 5.5” x 5”, dark pink paper 2” x 5” and patterned pink paper 6” x 5.25”, pink detailed rectangle 3” x 2”and green border 12” x 1.5” from HCDP1 239 Majestic Morning Paper Collections. 4. 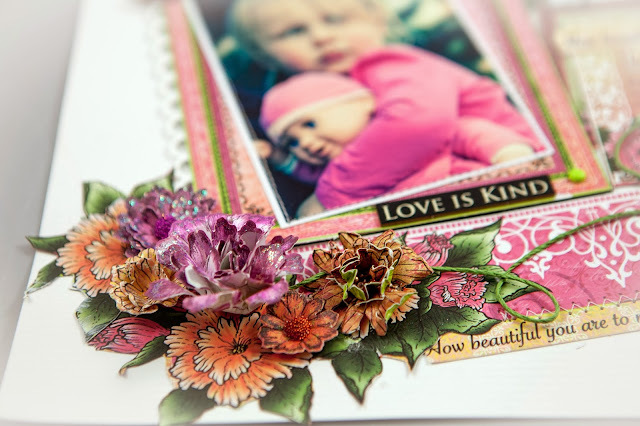 Make 4 flowers using orange paper and 3 using dark pink paper and stamping with the Majestic Morning BG stamp and cutting out with the coordinating die. For one of the crimson flowers use Brilliance Pearlescent Crimson to colour the edges of the white paper . 5. 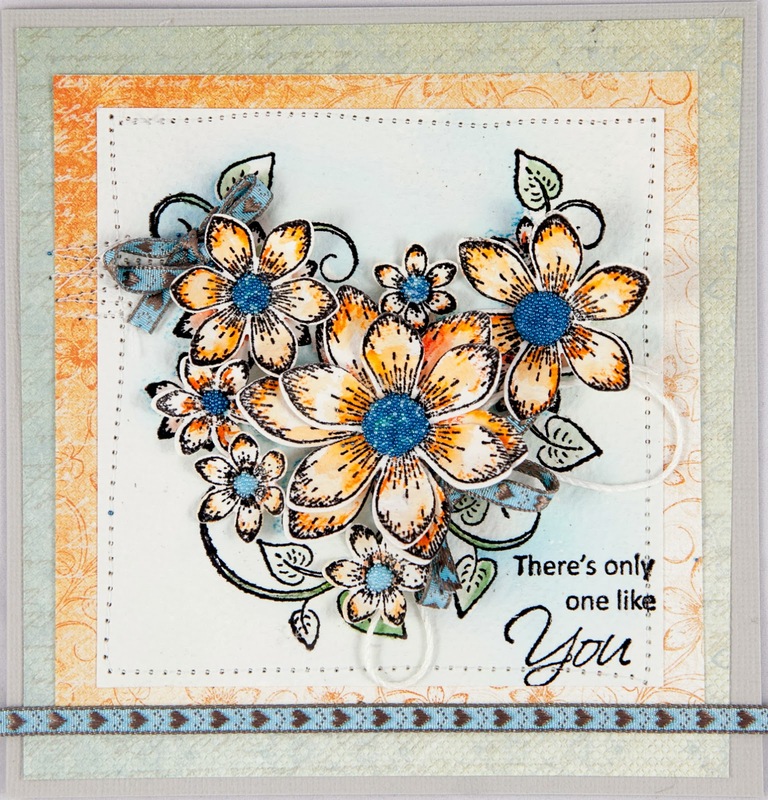 Make 2 orange flowers using the Vintage Morning BG stamp and cut out with the coordinating die. 6. Apply glitter to all flowers using 159723 Art Institute Glue – Dries Clear with 352854 Metal Glue Tip. 7. Shape the flowers with Paper Blossoms Molding Mat and Tool Kit. 8. Assemble flowers and add frinkles to the center of flowers choosing between gold and pink frinkles. 9. Stamp and cut out leaves from green papers. 10. Layout the pieces as shown in the photo and layer doilies on two diagonal ends of the photo. 11. Cluster the flowers and leaves including the muslin finishing off with the bling swirls and a hat pin. 12. 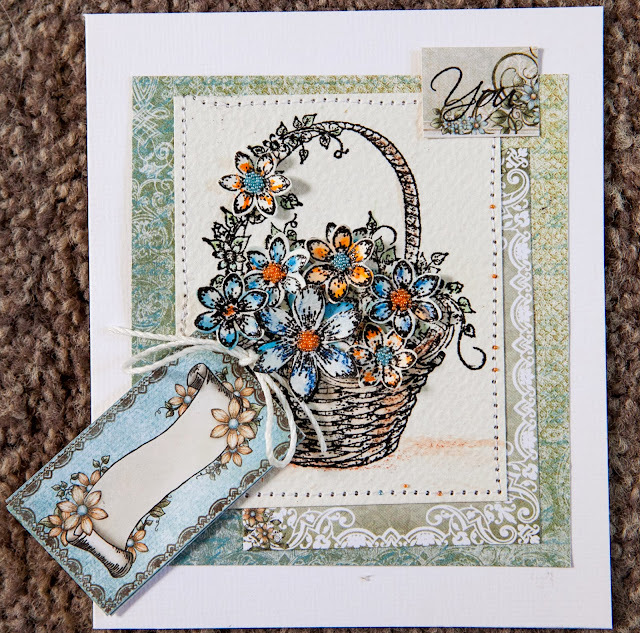 Use HCD 713 Decorative lace Border Die to cut white bazzill to create white accents. 13. Add brads, cut out title and chipboard words. 14. Assemble as shown in the photo. Thanks so much for calling by. 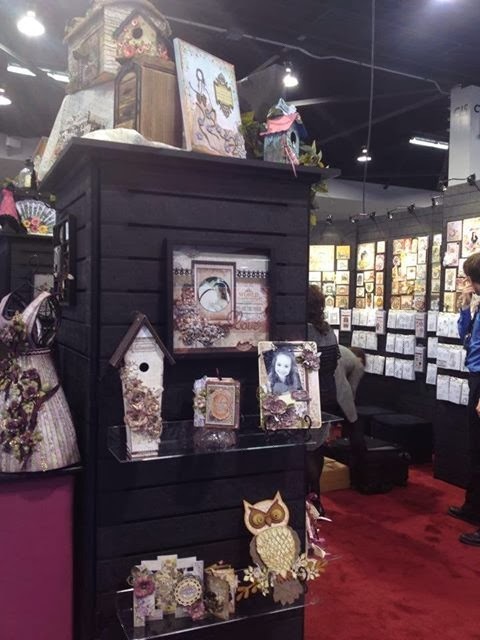 I have been very privileged as part of the Heartfelt Creations DT to have my work displayed at CHA (Winter 2014 in LA). Thank you all the team at Heartfelt Creations for making this possible. 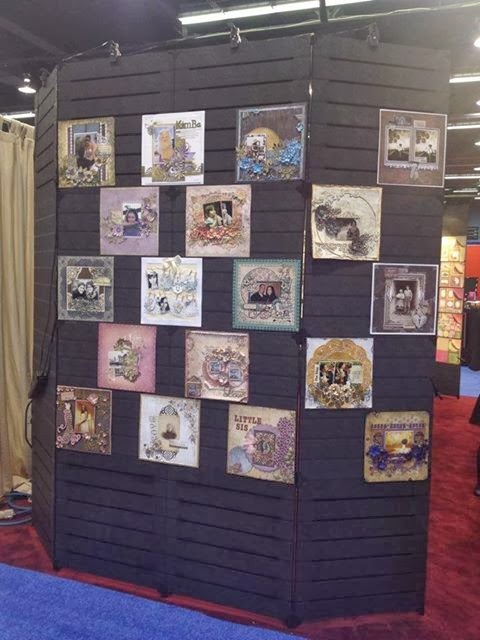 Lovely Angela Turner has shared some photos of the wonderful display. From all accounts the stand was amazing and all the flowers and projects were stunning beyond belief.' Have a look for yourself. Wow one of my LOs is on the left hand pillar behind the desk.......how exciting. There is my birdhouse on the second shelf to the left. 'You Are Adorable' is on the left hand side second from the top. 'Kimba' is top centre and my two vintage LOs using the Floral Keys Collection are furthest to the right on the first and third rows. Look at the dress form adorned with all the flowers...just gorgeous (not sure who made this one but it is just amazing). I think I also have a card and an altered book somewhere in the display....more photos will be posted soon so hopefully they will include these items. Well done to all involved...you did an awesome job. Thank so much for calling by. 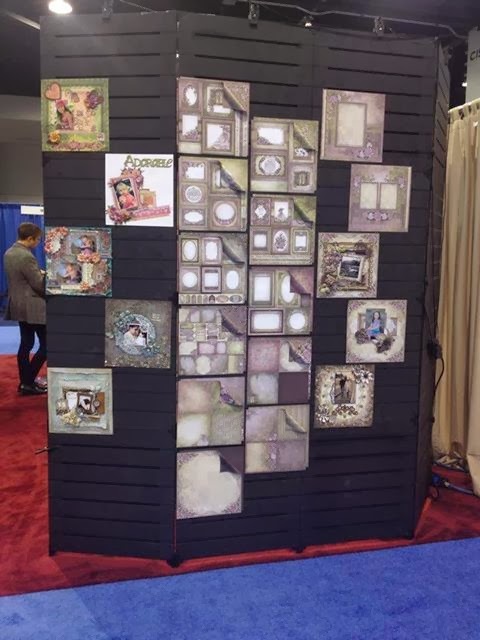 Here is my second layout that has been on display at CHA as part of Heartfelt Creations amazing January release 'Majestic Morning'. (And yes I am still pinching myself that my work is on display at CHA....I am one very lucky girl). As you all probably know by now...I love flowers and I had so much fun creating these clusters. There is lots of fussy cutting, water colouring and hand made flowers. I added the 'You are Loved' at the end...not sure whether I like it better with or without the title so I posted it both ways. White bazzill, white paper and thin white cardstock, Chipboard by Collections and Scrapmatts, Inks: Versamark Onyx Black and Brilliance Pearlescent Crimson, clear embossing powder and heat gun, Glimmer mist lime green and, sundry brads, sewing machine and thread, spritz bottle and water, pink and gold frinkles, white paint and colouring tools (I used a combination of tombows, water coloured crayons (Neo Color 2) and water colour pencils (Derwent) and Derwent Inktense). 2. Stamp HCPC 3323 Large Elegant Word Background Precut Set onto white bazzill and lightly spritz the cardstock with glimmer mist. 3. Using the photo as a guide fussy cut the flowers and cut out: frames, orange paper 5.5” x 7.75”, white bazzill 5.75” x 8” and green paper 7” x 9” from HCDP1 239 Majestic Morning Paper Collections. 4. Machine sew the photo onto the smaller frame. 5. Stamp the HCPC 3323 Large Elegant Word Background Precut Set onto white cardstock and trim to fit. Attach this to the center of the larger frame. 6. Rub white acrylic paint onto the edges of the frames. 7. Spray mist onto the chipboard leaves. Allow to dry. 8. Stamp HCPC 3578 Majestic Morning Background Precut Set onto white and orange paper (dark and light) and HCPC 3577 Vintage Morning Background Precut Set onto pink paper and light orange. 9. 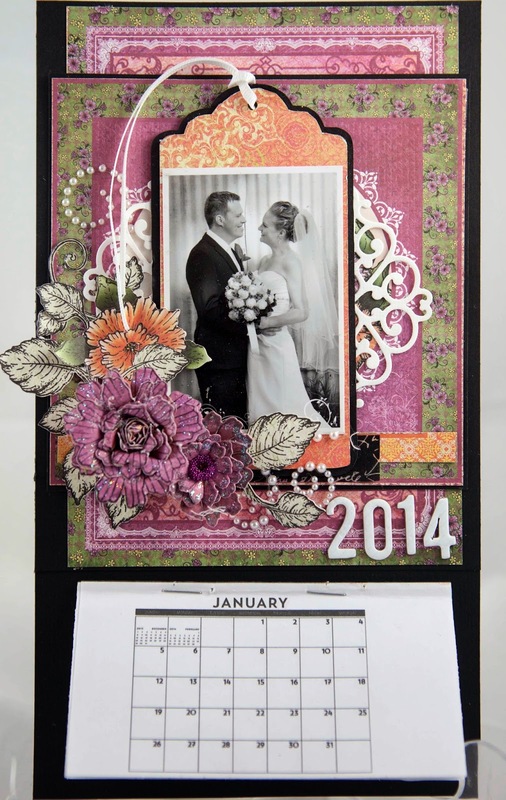 Cut out using HCD 742 Majestic Blooms Die. 10. Use Brilliance Pearlescent Crimson to colour the edges of the white paper flowers and apply glitter to all flowers using 159723 Art Institute Glue – Dries Clear with 352854 Metal Glue Tip. 11. Shape the flowers with Paper Blossoms Molding Mat and Tool Kit. (I spritzed the dark orange flowers with water prior to shaping them). 12. Assemble flowers and add frinkles to the center of flowers choosing between gold and pink frinkles. 13. Stamp HCPC 3580 Majestic Morning Blooms Precut Set and Majestic Morning Accents Precut set HCPC 3581onto thin white cardstock and clear emboss. 15. Use HCD 713 Decorative lace Border Die and HCD 718 Decorative Chateau Gate Die to cut white bazzill to create white accents. 16. Use the photo as a guide to lay out all the parts creating 2 floral clusters in the top RH and bottom LH corner. Add brads, cut out title and chipboard words. 17. Assemble as shown in the photo. Heartfelt Creations have released the 'Majestic Morning Collection' their new range for January 2014. This is hot off the press and on display at CHA right now. 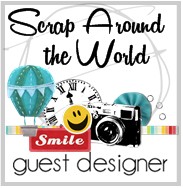 I am so excited as two of my layouts are part of the exhibition...thanks Heartfelt Creations for making this happen. 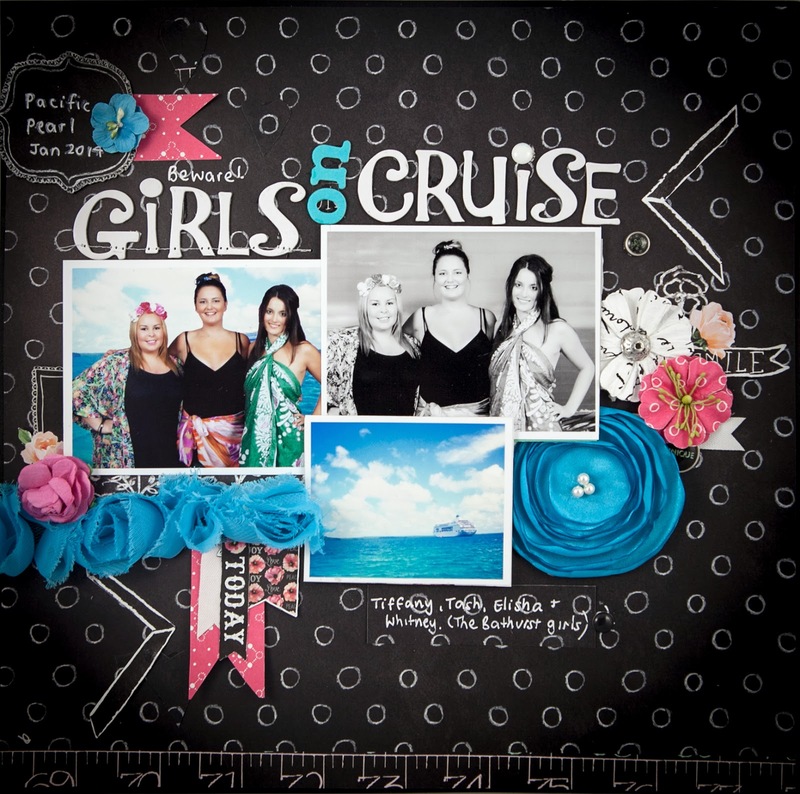 Here is one of the layouts but you have to wait for next week's Wednesday DT reveal to see the other...or visit CHA if you are lucky enough. Newsflash: As you know the weather in certain parts of the USA is absolutely freezing. Poor Emma Lou and the HFC crowd had their plane cancelled due to the terrible conditions. This means they will miss their first big workshop at CHA. Fingers crossed they can get a flight out of Chicago tomorrow.....thinking of you all and sending my very best wishes. 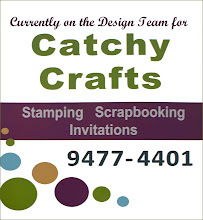 Have a look at their great website for more wonderful work samples. White bazzill, white paper, Chipboard by Scrapmatts, Collections and other, Brilliance Pearlescent crimson Ink, Glimmer mist: lime green and pink, sundry brads, green twine, sewing machine and thread, spritz bottle, water and frinkles:pink and gold. 3. Spray mists onto the chipboard title and bird. Allow to dry. 4. Stamp HCPC 3578 Majestic Morning Background Precut Set onto white and orange paper and HCPC 3577 Vintage Morning Background Precut Set onto pink paper. 5. 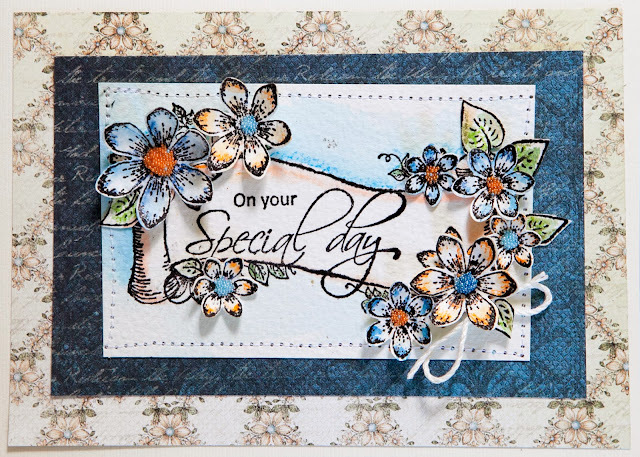 Cut out using HCD 742 Majestic Blooms Die. 6. Use pink ink to colour the edges of the white paper flowers and apply glitter to all flowers using 159723 Art Institute Glue – Dries Clear with 352854 Metal Glue Tip. 7. Shape the flowers with Paper Blossoms Molding Mat and Tool Kit. (I spritzed the orange flower with water prior to shaping it). 8. 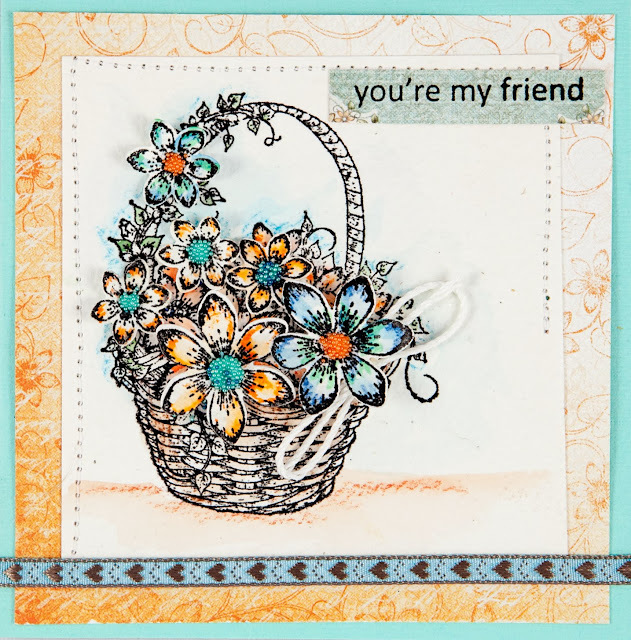 Assemble flowers and add frinkles to the center of one pink and inked flower. 9. Machine sew the photo onto the frame. 10. Cut the Decorative Lace Border with HCD 713 Decorative Lace Border Die. Layer under the frame with just the bottom scallops showing. 11. Assemble as shown in the photo embellishing with green twine and brads. Happy New Year...and this is my first post for 2014. 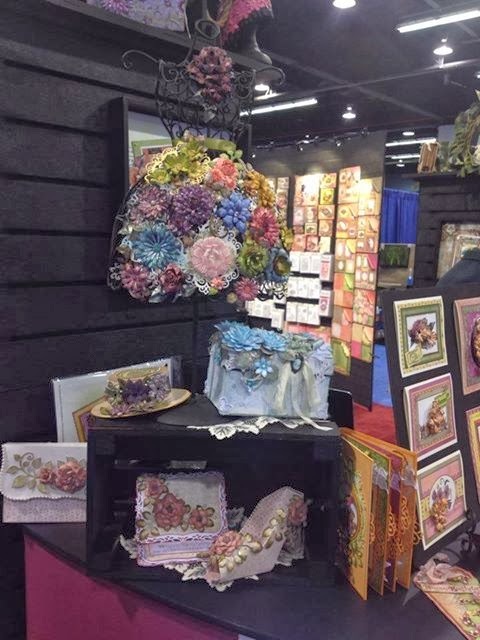 I am very excited because next week is CHA and Heartfelt Creations will be there with a stand brimming full of goodness showcasing their stunning January and February Collections. I can't say much yet except that the new releases are totally gorgeous. But before I get too ahead of myself, here is this week's reveal. These bright and cheerful cards were made using 'Sun Kissed Fleur Collection', one of my favourite Heartfelt Creations ranges. Pop across to Heartfelt Creations website for a look at more stunning work samples. Here is a bonus card that was not on the Heartfelt Creations blog post. Water colour paper, Tombow markers (Blue 528, Orange 933 and Teal 373), Derwent water colour pencils (Prussian Blue 35 and orange Chrome 10), string, sewing machine and thread, Martha Stewart Luster Glass Micro beads or Frinkles (Lapis, Blue Topaz, Feldspar and Fire Opal), bazzill card stock, Versa Mark Onyx Black, detail clear embossing powder, stamp positioner and heat gun. 2. 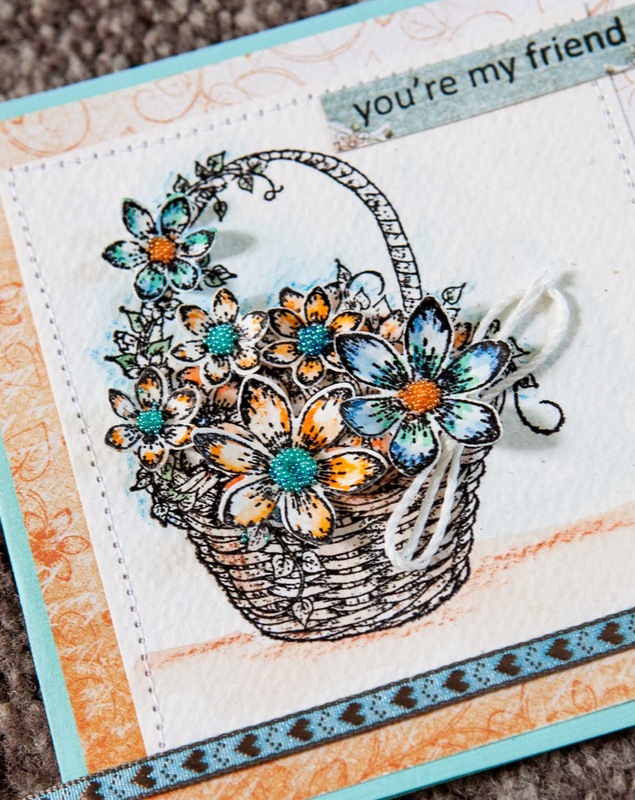 Stamp Basket image onto rough water colour paper and clear emboss using a heat gun. 3. Colour image using colouring method of your choice. (See product list for what I used). 5. Stamp the ‘Sun Kissed Fleur Precut Set’ and cut out with the Sun Kissed Fleur Die. 6. Colour 3 of the small flowers orange and 4 blue. 7. Use the molding mat and stylus to shape the flowers. 8. Use art Institute glue to stick frinkles into the centres of the flowers. 9. 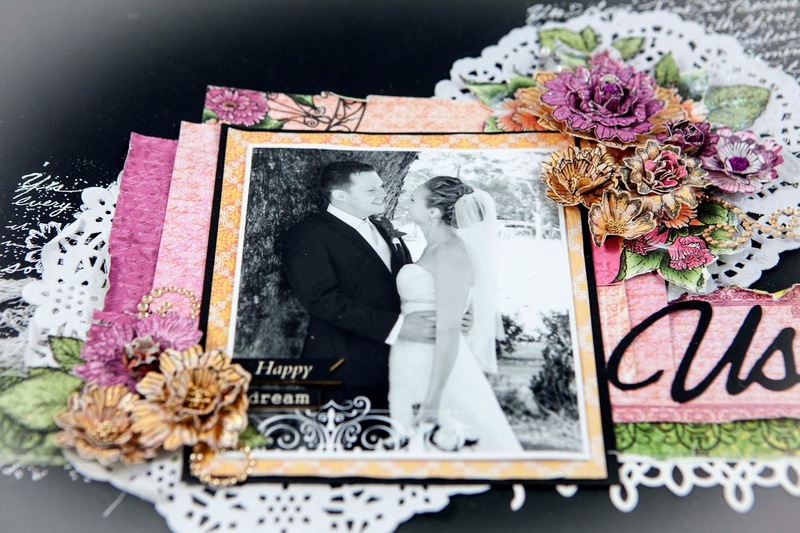 Matt the stamped image onto paper from the Sun Kissed Fleur papers using the photo as a guide. Paper 1 is 2.5” x 3.25” and Paper 2 is 3.75” x 4.25”. 10. Stamp the sentiment ‘You’ onto paper and trim. 11. Cut out the rectangle of paper with the small scroll and attach to the basket with a bow of twine. 12. Use strong glue to attach 7 small flowers. 13. Mount onto vertically folded bazzill. 7. 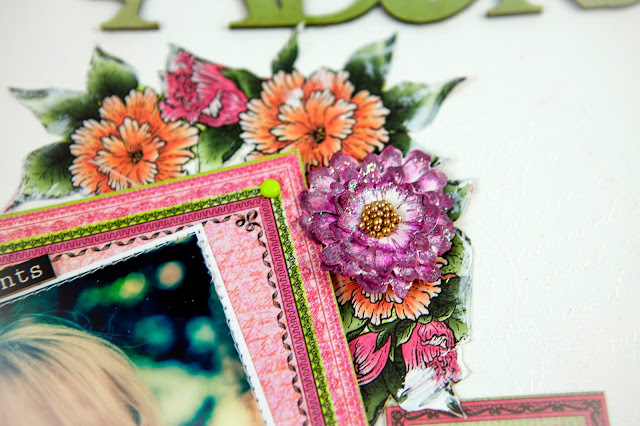 Use art Institute glue to stick crinkles into the centres of the flowers. 8. Use the molding mat and stylus to shape the flowers. 11. Machine sew around the edges of the water colour paper. 12. Stamp the sentiment ‘So Glad You’re My Friend’ and trim the ‘You’re my friend section. 13. Use strong glue to attach 5 small flowers. 14. Mount onto vertically folded bazzill. 15. Place a horizontal strip of coordinating ribbon along the base. 2. 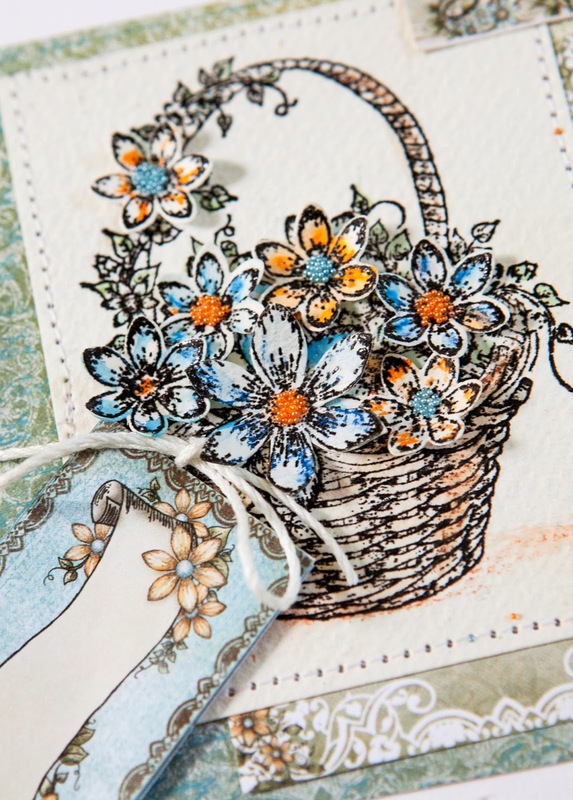 Stamp Floral Swirl onto rough water colour paper and clear emboss using a heat gun. 6. Colour three flowers blue (see photo for the relative sizes). 8. Add Frinkles to the centres of the flowers. 10. Machine sew around the edges of the water colour paper. 11. Stamp the sentiment Missing You onto the base of the card. 12. Use strong glue to attach 3 flowers. 14. Adhere twine bow under the large flower. 15. Use art Institute glue to stick frinkles into the centres of the flowers. 8. Machine sew around the edges of the water colour paper. 9. Stamp the sentiment ‘There’s only one like you’ onto the base of the card. 10. Use strong glue to attach flowers. 11. Mount onto vertically folded bazzill. 12. Adhere twine bow under the large flower on RH side. 13. Attach a piece of coloured ribbon horizontally along the base and tie into 2 bows and slide under flowers at the base and on the top RH side. 14. Use art Institute glue to stick frinkles into the centres of the flowers.